In late February, I mentioned Laurel's science fair project observing Squeaky's sense of smell and determining his preferred treat flavor. 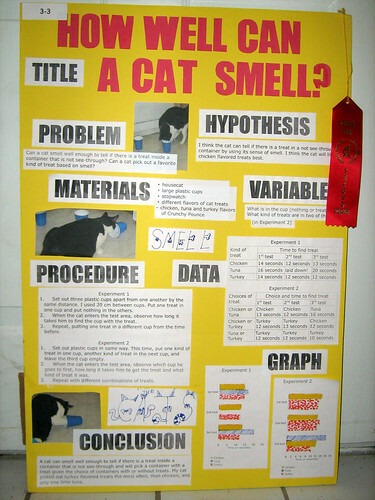 Her project was awarded second place and she brought home the ribbon a few weeks ago, but kept forgetting the display board. It finally came home so I took a photo of it for her to enjoy when she's older. Go Laurel! This looks great! laurel did so well! tell her hush and i send her big atta girls her way. Sometimes I wonder if elementary school projects, like the science fair, aren't more to see how involved the parents are and how much money they're willing to spend to make their kid's display flashy than they are projects for the kids. That's both informative and adorable. Ernie approves. Great job, and Ernie and Ichi both say that it's useful research and time well spent! What a great job and a neat project idea! Far better than mine was! I love the noses on the word "smell"!